Wake Up Your Bike... Put some Fire in the Hole! New Thundervolt50 8.2mm Spark Plug Wires unload spark plugs for easier starts. 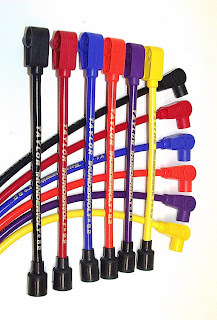 Spark plug wire core technology has always fired intermittantly resulting in carboned plugs. New Taylor core technology has a constant spark that cleans your plugs while you ride. You get a stronger running motor with better gas mileage (averaging 3 mpg). Core resistance is at 50 ohms per foot making them compatible with all OEM and a majority of after market electronic ignitions. Custom fit sets are available for all Harley Davidson Motorcycles. Universal sets come standard with 24" leads, coil boots and terminals. Colors: Black, Red & Blue, Yellow, Purple & Orange. Thundervolt wires are distributed throughout Europe by MC Storehouse and Zodiac.